I will be privileged in April, this year, to commence study toward a PhD with the Australian National University School of History. Living on Ngunnawal land as the Director of Canberra Museum and Gallery it will be no surprise that my topic concerns Canberra’s identity. It seems an appropriate time to share a few thoughts about what I plan to do. My research will take a forensic look at Canberra’s history on screen: from magic lantern to cinema and from television to smart device. How have our city and our sense of nationhood developed together in the age of the moving image? In a country of vast distances, the moving image plays a privileged role in shaping the ‘imagined community’ of nation and influencing perceptions of what for many is a remote national capital. I am, of course, also keen to examine the way that galleries, libraries, archives and museums have made use of archival film of Canberra to tell stories of nation; and how this material is coming to be accessed digitally, on demand. 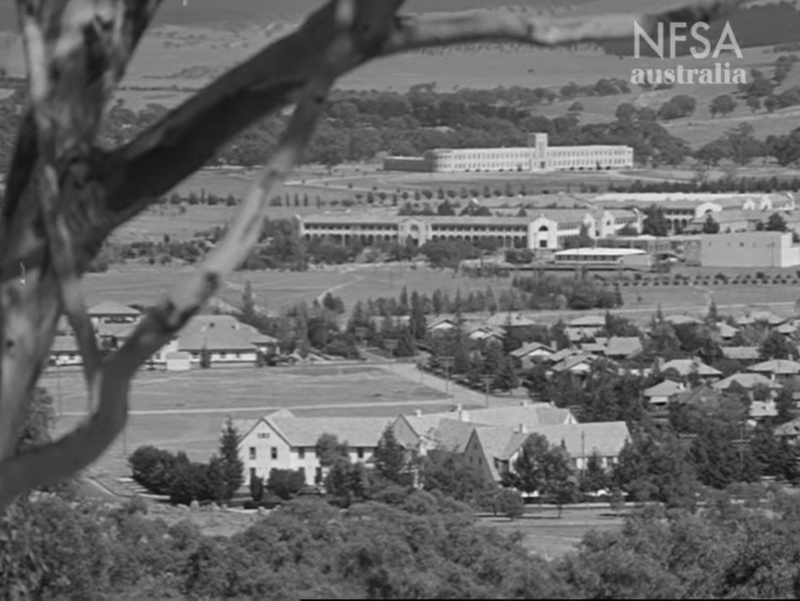 ‘Canberra is more than a group of government buildings set in a Garden City, it’s a community of 12,000 people… Most Canberra people know each other, at least by sight, and share a casual friendliness that is part of the Australian Character.’ Still from National Capital c1945. Courtesy National Film and Sound Archive. The way the moving image has bound us together as Australians and even as Canberrans fascinates me. 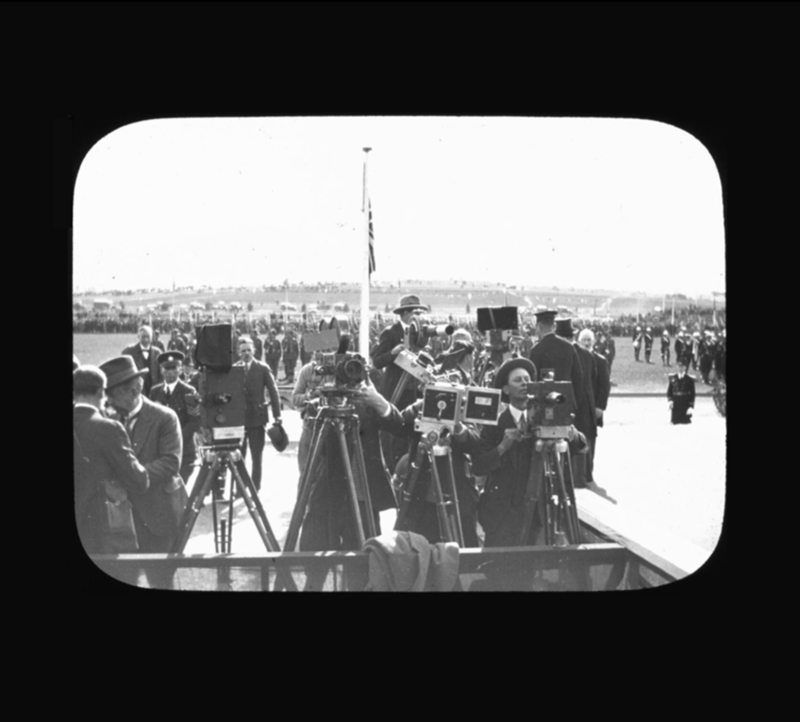 In 1901 Australia became the first nation to have its federation recorded on motion picture film; in 1913 Canberra became the first national capital to have the ceremony of its official naming recorded likewise. Among the many iconic moving images of Canberra are the 1927 opening of Parliament, the 1964 inauguration of Lake Burley Griffin, the 1972 installation of the Aboriginal Tent Embassy, the Dismissal of 1975 and the 2008 Apology to the Stolen Generations. Together with a raft of ‘unofficial’ films these sequences will form key parts of my study. More contemporary material such as a 2013 montage of archival film prepared and publicly screened by the National Film and Sound Archive for the Centenary of Canberra, and the 2016 Foxtel television series ‘Secret City’ will provide contemporary touch-points. 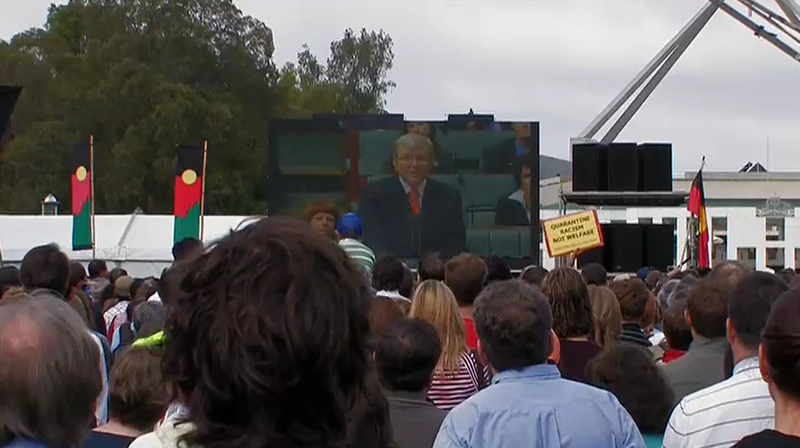 On 13 February 2008 crowds gathered in Australian capital cities to watch Prime Minister Kevin Rudd deliver The Apology to the Stolen Generations live from the House of Representatives at Australian Parliament House. This crowd is watching from the lawns in front of Australian Parliament House. Still from Emily in Japan – The making of an exhibition 2009. Courtesy Ronin Films. What are the implications of this paradox for our national identity as it is portrayed through information technology? 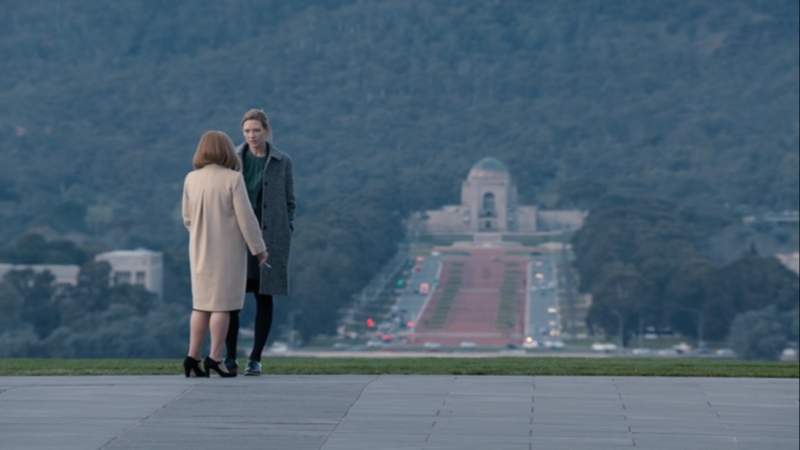 Attorney General, Catriona Bailey (Jacki Weaver) feeds a story to investigative journalist Harriet Dunkley (Anna Torv). Still from 'Secret City' 2016. Based on 'The Marmalade Files' and 'The Mandarin Code' written by Chris Uhlmann and Steve Lewis. Courtesy Matchbox Pictures. The generosity of my employer, the Cultural Facilities Corporation, will allow me to take extended leave for the first phase of this research, recognising the benefits it will bring to our organisation. I don't take for granted that this leave flows from the working conditions I enjoy as an ACT Public Servant and the critical work of our unions in securing these conditions. Where we can do so, we should always put our leave to good work for the community that sustains us. Alongside the professional, organisational and academic value of this research, it would be wrong not to acknowledge the personal stimulation I will enjoy in going ‘back to the well’ of academic study. There has been some significant commentary on life’s transitions recently, and through my own personal life transition, I hope to find new ways to improve my own society’s cohesion. New research in this field was compellingly explored in a recent episode of ABC Radio National's Life Matters with clinical psychologist Delyse Hutchinson and author Jonathan Rauch. I am pleased to have had warm interest in this planned research from the ANU School of History and from the institutions that house Canberra’s rich collections of still and moving images. These include the National Film and Sound Archive, National Archives of Australia, National Library of Australia and ACT Heritage Library. ScreenCanberra, which supports the growth of the ACT screen industry will be an equally important ally in the project. I look forward to posting regular updates, reaching out for advice, and welcoming contributions from others via a new webpage www.canberraonscreen.com . I invite you to check in and contribute to the conversation when you get a chance. Title Image: Mildenhall, William James. Photographers and press outside Parliament House. Glass slide. http://nla.gov.au/nla.obj-141435641 Courtesy National Library of Australia.